Lindeth Fell Country House Guest AccommodationSuperb luxury bed and breakfast accommodation, perfectly located overlooking Lake Windermere. There are 14 individually designed bedrooms each with its own modern, airy bathroom. All have crisp Egyptian cotton bed linen, deluxe fluffy towels, White company bathroom amenities, sherry decanters in the room on arrival, DAB radio / Bluetooth, and flat screen television. Many have superb lake views. All have tea / coffee trays and the Master rooms have Nespresso coffee machines. Start the day with a delicious breakfast served in our sunny dining room, overlooking 7 acres of beautiful gardens and the stunning Coniston mountain range. We offer complimentary tea and scones on arrival and now have a range of cold platters available to pre order in the evenings. We have two cosy lounges with log fires in winter, and a new fully licensed residents bar. We also offer free Spa access to a local leisure facility in Bowness. Lindeth Fell offers free parking and is located just 5 minutes' drive from the Windermere ferry crossing and only a mile from Bowness. Windermere railway station is 10 minutes by taxi. Free Wi-Fi access. We provide a friendly and relaxing place for you to stay where we hope to make your well earned break a special one. 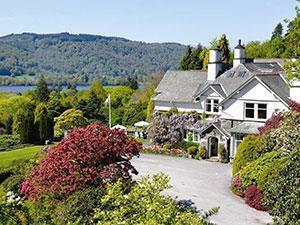 Set in 7 acres of landscaped gardens, overlooking Lake Windermere. Children welcome from any age. Lindeth Fell Country House sometimes limits bookings to 3 or more days. Convenient flexible family room sleeps 2. A large, Superior ground floor room with views of the shrubs at the rear of the property. Super-king sized bed, can also be made as twin. Can provide a rollaway / travel cot for a child. Suitable for ambulant disabled. En suite bathroom with large walk in shower. Also has a separate en suite wash room with toilet and hand basin. Can provide stool for shower and hand rails for toilet – on request. White company products. Tea/coffee making facilities. Nespresso coffee machine. Robes and slippers. DAB radio/Bluetooth. Reduced prices for a child provided there are 2 adults in the room. Complimentary tea and scones on arrival. Sherry decanter in room on arrival. Buttermere sometimes limits bookings to 3 or more days. A Classic room on the first floor with beautiful views of lake Windermere. 5’ double bed. En suite bathroom with bath and overhead shower unit. White company bath products. Egyptian cotton bed linen and deluxe fluffy towels. Robes & slippers. Tea/coffee making facilities. Nespresso coffee. Flat screen TV and DAB radio. Complimentary tea and scones on arrival. Sherry decanter in room on arrival. Coniston sometimes limits bookings to 3 or more days. A Superior room on the first floor with garden views and glimpses of the lake. En suite bathroom with bath and overhead power shower. White company bath products. Egyptian cotton bed linen and deluxe fluffy towels. Robes & slippers. Tea/coffee making facilities. Nespresso coffee. Flat screen TV and DAB radio. Complimentary tea and scones on arrival. Sherry decanter in room on arrival. Ennerdale sometimes limits bookings to 3 or more days. A delightful Classic double room on the second floor, with garden view and glimpses of the lake. En suite bathroom with walk in power shower. White company bath products. Robes & slippers. Egyptian cotton bed linen and deluxe fluffy towels. Tea/coffee making facilities. Nespresso coffee. Flat screen TV and DAB radio. Complimentary tea and scones on arrival. Sherry decanter in room on arrival. Esthwaite sometimes limits bookings to 3 or more days. Leave the M6 at jct 36 to The Lakes. Follow A590/A591 for 7 miles. At 1st roundabout take 1st left signed Crook B5284. Follow this for 7 miles to T-junction, turn left onto the A5074 Lyth Valley Road. Lindeth Fell is 200yds along on the left. Our room was clean and quiet. The entire stay was met with good breakfast, personalized service, comfortable and very clean room and classic charm meets minden. We will absolutely ne back. The Kennedy family and their staff at Lindeth Fell aim to ensure that all guests have comfortable facilities, all requests are dealt with efficiently and all guests are made feel welcome throughout their stay. Please see our web site for full access statement.